Merkel's Allies Falter In Regional Elections, As Rivals Gain On Left And Right The German chancellor's center-right sister party has long been a juggernaut in Bavaria, but it didn't look like it Sunday. Katrin Ebner-Steiner (center), regional leader of the Alternative for Germany, celebrates with party co-leader Alice Weidel (right) as election results roll in Sunday in Mamming, Germany. On Sunday, Bavarian voters dealt the longtime leader still another tough blow. Merkel's conservative allies in the region, the Christian Social Union, are projected to receive their second-worst result in regional elections since 1946. The CSU, the Bavarian sister party to Merkel's Christian Democratic Union, is set to lose its majority rule in the region, where the party has long been an all but unbeatable juggernaut in postwar Germany. The German broadcaster ARD projects the CSU to win around 37 percent of the vote and retain a first place finish, but in its battered state, it will need to partner with another party to cobble together a governing coalition. The CSU's losses proved a boon for rival parties on its left and right ideological flanks. Sunday's biggest winners are likely to be the environmentalist Green Party, which is expected to win the second-most votes, and the far-right Alternative for Germany, or AfD — which won seats in the Bavarian regional parliament for the first time. "Those who voted for the AfD in Bavaria were also saying 'Merkel must go,' " the party's co-leader, Alice Weidel, said Sunday in Berlin, according to Deutsche Welle. "Thirty-three percent for the CSU and 10 percent for the [Social Democrats]. That's a mini-coalition, not a grand one. The partners in the national coalition should clear the way for fresh elections." The five-year-old populist party has ridden a staunchly anti-immigrant position to a role as the official opposition in Germany's national parliament. And as NPR's Soraya Sarhaddi Nelson reports, the AfD has found particularly fertile ground for its ideas in the southern state of Bavaria, the country's most prosperous. Perhaps for that reason, despite the AfD's historic day, German media cast its fourth-place finish Sunday — just behind a coalition called the Free Voters — as something of a disappointment for the far-right populists. 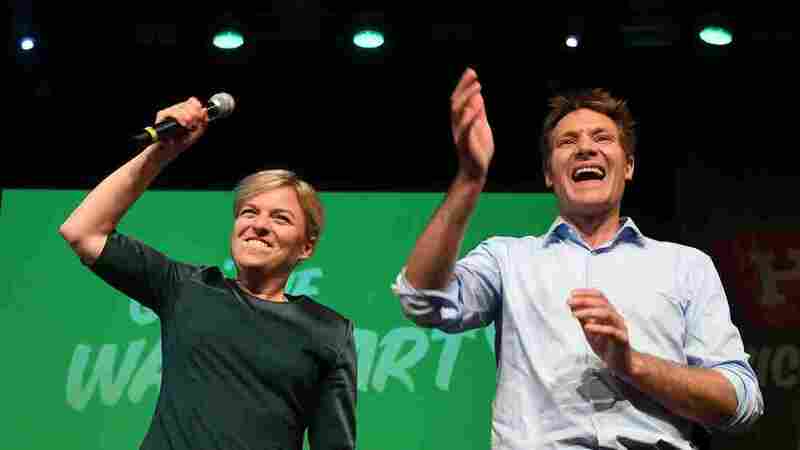 Top candidates of the Green party in Bavaria, Katharina Schulze and Ludwig Hartmann, celebrate with supporters at an election party Sunday in Munich. The Greens' wins on Sunday appeared to come without caveats. The party more than doubled its share of the vote from the last regional elections, back in 2013. "If you follow the media, you get the impression that everyone's turning to the right, to racism. But it's not like this. Normal people just haven't been loud enough," one Bavarian voter told The Washington Post. "Now we're getting louder." Significantly more muted was the response Sunday from the CSU. "We have to analyse the changes taking place both in Bavaria and in society," said party member Markus Söder, the Bavarian prime minister, according to the BBC. "One of the most important jobs we now have is to ensure that this state is stable, governable, and remains as strong as it is now." At the moment, for Merkel's allies that means regrouping and forging a coalition with at least one other party — something the party has not needed to do in decades.